Custom Vertical X stand banner stands are available in the Las Vegas area. These x stand banner stand are very economical when compared to the retractable banner stand and offer the same easy set up and portability. Custom vertical x stand banner stands are being used by trade shows, conventions and in house store displays because they are low cost and easy to set up. Below is a You Tube video of how they look, https://www.youtube.com/watch?v=OkjZ9glitnU . As you can see, they are very easy to work with and offer a convenient carrying case. This particular custom vertical x stand banner stand is a 24″ x 63″ size, however they also come in a variety of other sizes to match your budget and needs. Custom vertical x stand banner stands have hooks in the 4 corners that allow for the banner print to be attached to a grommet located in each of the 4 corners of the banner. This allows for the banner to be slightly stretched allowing for a tight banner display. The edges are reinforced through a hemming process for additional strength. The custom vertical x stand banner stands come with a convenient carrying case which allows you to repeatedly use the x stand over and over again. Custom vertical x stand banner stands are cheap. The average cost of a 24″ x 63″ model is under $50.00. AT this cost, they are about half the cost of a vertical retractable banner stand. Many sores in Las Vegas, like comic book stores, love these cheap x stand banner stands because they allow for in house displays of some of the comic book characters. This results in additional sales and also many times the stores will mark up the x stand banner stand and sell it or offer it in some sort of store promotion for their clients. Las Vegas X stand 32″ x 71″ banner stand is available in the Las Vegas area at a substantial savings compared to nationwide. The reason being is that Las Vegas is the convention and trade show capital of the world and the sign shops in Las Vegas produce many of these Las Vegas x stand 32″ x 71″ banner stand for the conventions held here. Consequently, the volume discount principle applies here. Las Vegas is known for its trade shows and conventions and is a very popular place to have these shows at. And why not ? Las Vegas has some of the best entertainment, gambling, fine dining, golf, tennis, and night life in the world. Las Vegas is a 24 hour party place as compared to Wisconsin in the middle of winter. Everybody wants to have their trade shows and conventions held here. Consequently, there are many support industries for the trade shows. The sign industry being one of them that supports the trade shows. Sign shops in the Las Vegas area have state of the art equipment to make the necessary signage for the trade shows. Las Vegas x stand 32″ x 71″ banner stand is available online and at local sign shops in Las Vegas. Many customers attending the trade shows prefer to have the graphics designed and printed in Las Vegas to make sure that hey do not get lost or damaged in transit. Las Vegas 89107 banners are helping businesses in the Las Vegas area get higher sales and increased profits. And who couldn’t use additional business in these challenging economic times. The United States has been in a recession since 2008 and businesses need to think out side the box to survive. 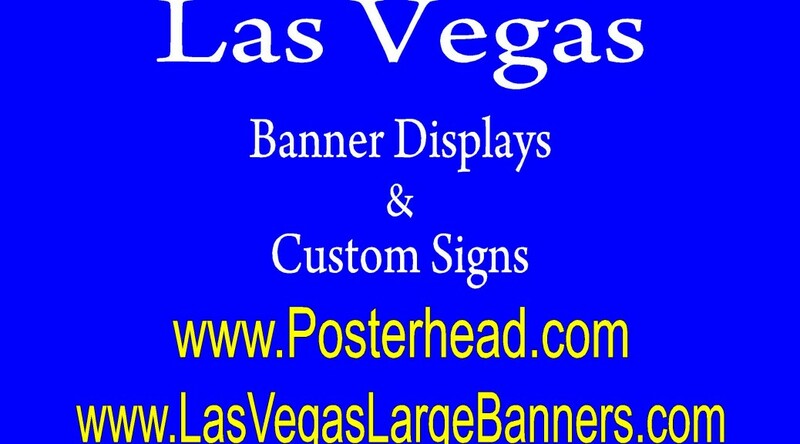 Las Vegas 89107 banners is a cheap and easy way to increase your business. Traffic is increasing in the Las Vegas area as the population grows. Consequently there are more vehicles on the streets of Las Vegas than ever before. Why not take advantage of this increased traffic and place a vinyl banner on your building so that it can be seen by the thousands of vehicles that drive the streets of Las Vegas every day. A check with the Nevada Department of Transportation will allow you to discover how many vehicles pass your store everyday. Your Las Vegas 89107 banners will act as a small billboard and be seen by these people passing by your store. You could rotate your banners so as to give a fresh appearance of new merchandise to increase sales as well. A local beauty salon in the Las Vegas area uses these banners as a way to attract customers. The owner will advertise a nail special that will drive people in, then the following week advertise another beauty service at a very low price with the intention of just driving business to her location. Once she gets the customer in for a low cost beauty service, she sells them another beauty service as well. Not only is she increasing customer retention rates, she is also getting new customers. Las Vegas 89107 banners work very well for her business. She relies upon the 3ft x 5ft banner to get her business noticed. Vinyl banners work as a low cost approach to gaining new customers and for increased business profits. Las Vegas 89119 Online Banner Printing. Las Vegas 89119 online banner printing allows you to design your own banners online and order your banners online and pick them up in Las Vegas. Advances in technology have allowed for online sign design programs to be installed on websites. Many businesses prefer to design their own vinyl banners because sometimes it is just difficult to explain exactly what you want on your banner to a sign shop. By designing your own banner online, you get to see how it is going to look in a variety of ways. The design programs are easy to use ( sort of like a Photoshop or Adobe Illustrated type design programs), allow for customization through the uploading of images and designs to incorporate into your sign design to make sure you get the banner you want. Las Vegas 89119 online banners are then printed with large format printers on the substrate that you want. Normally, the 13 ounce banner material is the standard of the industry, but other substrates are available to be printed on as well. There is the heavy duty16 ounce banner material for 3 x the life of he 13 ounce material and also the mesh banner ( which allows air to pass through the banner). In windy areas, the mesh banner works well because if strung between trees or poles, the wind cause high stress on the conventional banner where the banner is tied to the poles. But with the mesh banner, the air is allowed to travel through the vinyl banner giving it a much longer life expectancy. A normal banner in the wind is much like a kite, eventually the kite will break or the rope will break. Once printed, your Las Vegas 89119 Online Banner printing design can be picked up at your local sign shop or print shop in the Las Vegas area. Cheap Spring Valley 89148 banners are helping Spring Valley businesses become more profitable. Simple cheap banners are helping Spring Valley businesses become more competitive than traditional advertising. Cheap Spring Valley 89148 banners are being placed all over businesses in the Spring Valley area. These cheap banners act as a small billboard and are being seen by the hundreds of people that drive the streets of Spring Valley. Traffic studies put out by the Nevada Dept. of Transportation state that hundreds of vehicles are driving on the streets ( all streets on average) every single day. By placing cheap banners at stores locations, they are being seen day in and day out. The average life expectancy of a cheap vinyl banner exceeds a year. That is pretty good considering we have some of the hottest weather in the country during the summer months. These banners are being printed on a heavy vinyl banner material with inks designed not to fade for up to 3 years. Cheap Spring Valley 89148 banners are just that, cheap ! This simple vinyl banner offers a great return on the cost when compared to other forms of advertising from radio ads to print ads. While those type of ads are seen for a few days and forgotten, your cheap Spring Valley 89148 banner will be seen by thousands of people over a period of a year. Many stores rotate their banners so that they always have new products and services being offered on the banners. Local businesses that are trendy are especially liking these cheap banners because their inventory constantly changes and by using these banners, they are able to sell out more quickly and move into different products. Cheap Spring Valley 89148 banners can be purchased online or at local sign shops in the Las Vegas area at very reasonable prices. Check out how these cheap banners can help you. Las Vegas Banner Printing Online. 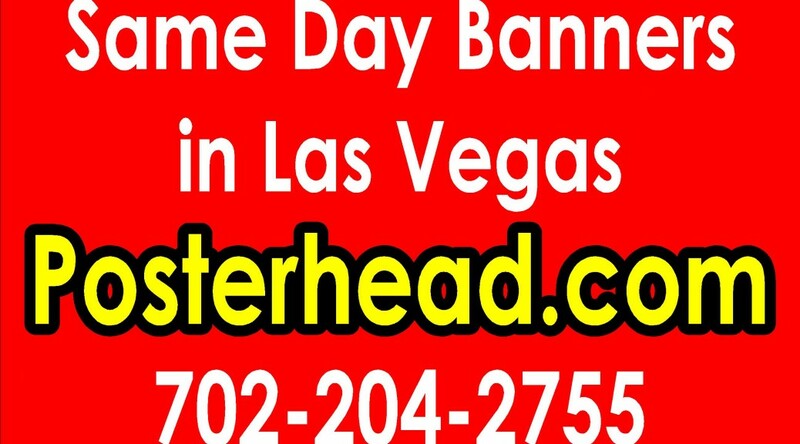 Las Vegas banner printing online is available in the Las Vegas area . Sign shops in the Las Vegas area like www.posterhead.com has online sign making on their website so that you can design and pay for your banner online and then pick it up in Las Vegas. Las Vegas banner printing online offers different type of banners to assist you in your endeavors. There are many types of banners, mesh, vinyl, step and repeat, retractable , etc. 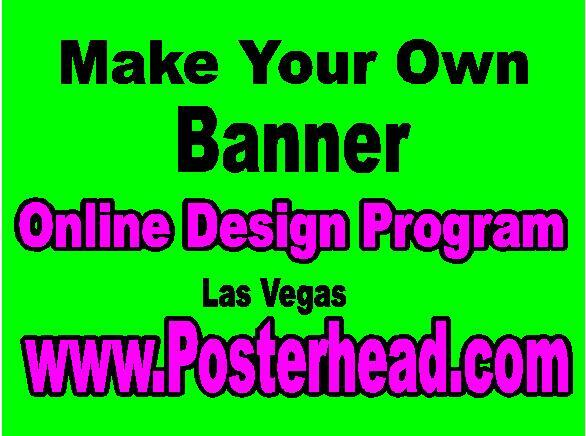 Las Vegas banner printing online offers online design program with custom design available. There are many templates to choose from but you can design your own custom banner with the design program. There are many options such as text, colors, graphics, etc. that can truly make your design a custom banner. Logos, pictures and other designs can be uploaded into the program to assit you in making that banner truly special. Las Vegas banner printing online offers your banner to be printed on a multitude of different substrates. The most common substrate would be the standard of the industry ( the 13 ounce banner) with latex or eco solvent inks. material) . Heavy duty banner material is offered along with mesh banner ( banner substrate with holes in the banner material that allows air to pas through the banner instead of putting pressure on the banner). The heavy duty banner material would be printed with a 16 ounce banner material that has more than 2x the life of the 13 ounce banner material. There is no extra charge for making the custom banner online. Simply click on the custom design section of the website and you can create your special banner at no extra charge. Las Vegas banner printing online can be yours be going to your favorite sign shop in Las Vegas and clicking the appropriate box. Automatic pricing will let you know exactly what the cost is of creating your banner. Las Vegas 89102 banner printing will allow your business to improve through its use of outdoor vinyl banners as a means to advertise your business. Many Las Vegas businesses are facing tough economic times because of the state of the economy and are looking for ways to improve sales. Las Vegas 89102 banner printing can get your vinyl banner printed at a very low price. The average cost of a vinyl banner in the Las Vegas area is a couple of dollars a square foot. This banner is printed on a 13 ounce banner material with inks designed for use indoors and outdoors without fading. This is important because without using the right inks, the hot summer sun of Las Vegas will quickly fade your banners colors. Make sure that latex or eco solvent inks are used in the printing of your vinyl banner. These inks are guaranteed to last 3 years in outdoor weather conditions. Las Vegas 89102 banner printing is being used by entrepreneurs in the Las Vegas area to improve store sales. Traffic is increasing in the Las Vegas area and business is taking notice of the increase in traffic going by their stores. By placing these vinyl banners on their stores, they act as sort of a billboard and attract the attention of people as they drive by. The banners are cheap and a 4ft x 8ft banner is less than $65.00 and will last over a year outdoors in Las Vegas weather. These large banners can be seen by the hundreds of vehicles that pass by their stores every single day. Compared to print advertising, this is by far the greater bang for the buck. Many stores simply rotate their banners so that fresh advertising material is always observed by passing traffic. Las Vegas 89102 banner printing can be found at print shops or sign shops in the Las Vegas area. Cheap Spring Valley 89147 banners are great for business and can make your business grow. These outdoor vinyl banners are low cost and offer a great return on investment. Many businesses in the Spring Valley area are putting these vinyl banners in their marketing repertoire. Cheap Spring Valley 89147 are just that, low cost banners. The average price of a cheap Spring Valley 89147 banner is about $2.00 a square foot. Many times specials will be offered by local sign shops on vinyl banners as well. currently, many sign shops in the Las Vegas area are offering full color vinyl banners in the 3ft x 8ft size for $39.00. AT this price the banners can be put up and then rotated to promote other store services or products on a regular basis. A ice cream shop in Spring Valley is currently using a 3ft x 5ft vinyl outdoor banner to promote different flavors of ice cream. They use these cheap Spring Valley 89147 banners as a large sign to gather interest in their products. Every time they get a new flavor of ice cream in, or just want to promote a ice cream flavor, they put up a 3ft x 5ft vinyl banner for a week to bring in the customers. And does it work ! The ice cream store rotates their banners every week so that they appeal to a wider target audience and the neighborhood is always checking out what flavors are in or what specials they have going on. During the summer months, the ice cream store is packed with customers from the advertising on the banners. The ice cream store knows it works, because sales volume of the particular flavor they are advertising on their cheap Spring Valley 89147 banners skyrockets for the period in which the banner is hung. Best of all the banners can be saved and used over and over again. Las Vegas 89104 banners can assist your store in becoming more successful by using vinyl banners to advertise your name and products or services. While stores are paying hundreds of dollars to advertise in the telephone book, weekly mailbox coupons, newspapers and other ads, only a fraction of that amount is necessary to get a full color large vinyl banner hung at your store location. Las Vegas 89104 banners work ! There is a cleaners store in Las Vegas that found by using cheap low cost banners as his advertisement, he has increased his business substantially. One week he will advertise a cleaning special on bed comforters for a low price. He will make a 3ft x 8ft full color outdoor banner and hang it for display at the front of his store and drive traffic to him. The following week he will advertise a special on suits for the casino business, the next week he will advertise a woman’s blouse special and so on. The cleaner’s store has 6 banners they rotate and they get great results. People in the neighborhood are always taking notice of his store and what special they have going on. The owner of the cleaners does this because during the week he is not advertising a special, he is still getting residual traffic for other clothes cleanings. Las Vegas 89104 banners are cheap. In the above example, the 3ft x 8ft full color outdoor banner costs $39.00 and is available through many sign shops in the Las Vegas area. The point is that vinyl banners are a cheap form of advertisement and will bring in many customers. Compare a simple vinyl banner to hundreds of dollars spent on print ads and you will see the value that a simple banner has to offer. These vinyl banners will last more than a year in the Las Vegas weather and can be saved and used over and over again. Paradise 89118 banner signs are being used all over the Paradise Las Vegas area for business and sporting events. These portable and cheap banner signs are great for temporary display of a product or name. Paradise 89118 banner signs are increasing in popularity at sporting events at parks in the Las Vegas area. That is because many of the sporting parks where youth soccer games, baseball games, football, etc. do not have scoreboards or other signage to let people know who is playing and the scores of the games. This makes it very confusing when multiple games are being played on the fields and you have to find the right game to watch. As a result, many teams are now making team banners to display at the games to let everybody know who they are. The banner signs are being zipped ties to fences long the field or on the back of chairs. Paradise 89118 banner signs are also being used by businesses to promote their businesses. Owners have found out through traffic studies that thousands of vehicles travel the streets of Las Vegas everyday and by placing a large vinyl banner on their building that can be seen by the passing motorists, it acts as a billboard and encourages business. These cheap banner signs ( at a cost of around $2.00 a square foot) are very cost effective when compared to other forms of advertisement. While a newspaper ad or print ad may cost hundreds of dollars and be seen for only a few days, a simple banner will last more than a couple of years and potentially be seen by hundreds of thousands of people. These low cost banner signs can be full color, come with grommets and are ready to hang with simple screws. Once hung, its just a matter of sitting back and waiting for the banner sign to bring in the customers.